I received a lemming in the mail today. 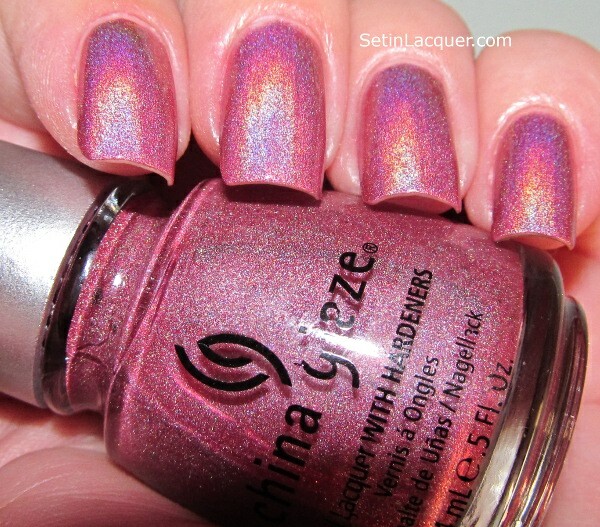 China Glaze BFF from the OMG Collection. I have been wanting a polish from this collection from a while. I am not really sure it lived up to the grand illusion I had in my mind. Don't get me wrong. It is gorgeous. And I am sure it will be even more glorious in the sun. Unfortunately there is no sun here today - but of course I couldn't wait to try it. The formula is relatively thin. But by the second coat it provided decent coverage. The third coat brought it to exactly where I wanted it. It does need a top coat as I thought the shine just wasn't "popping." When I saw it in regular light I wasn't overly impressed. Then I used the flash. Boy that changed my mind in a hurry. A wonderful rainbow of prisms was on my nails. The holographic effect is obviously a little shy without sun or a flash.